Morgoth is a German death metal band that was formed in 1985 by Rüdiger Hennecke and Carsten Otterbach in Meschede. Originally the name Cadaverous Smell was used and the band played grindcore / noise style. When Harry Busse joined the band they renamed themselves to "Minas Morgul". In 1985 the band settled on Morgoth when singer and bass-player Marc Grewe joined the band. The name was derived from the epithet of the original dark lord Melkor in J.R.R Tolkien's Middle-earth Legendarium. 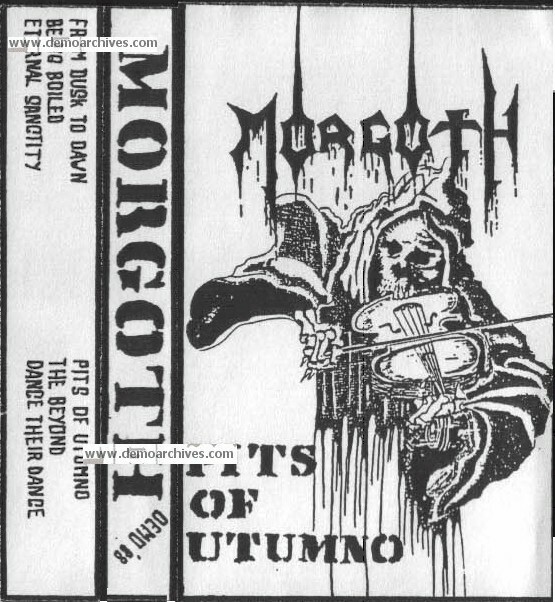 They recorded the Pits of Utumno demo on four tracks in 1988, which eventually led to the band being signed with Century Media, which had just started. 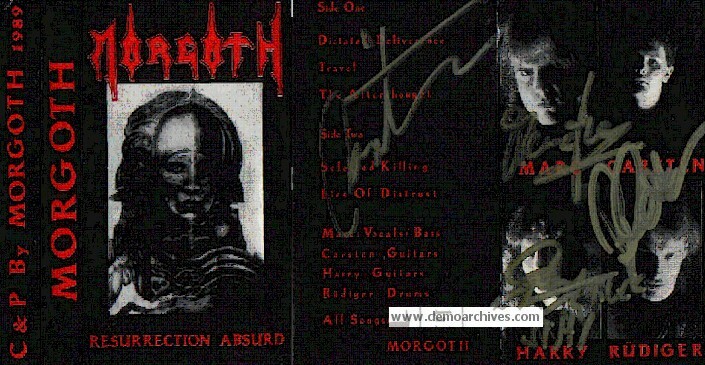 In 1989, Morgoth recorded their second demo Resurrection Absurd in a twenty-four-track studio, which was released by Century Media in the same year as an EP. The band then toured Germany in support of Pestilence and Autopsy. The Eternal Fall was recorded shortly after the tour finished, which was quickly followed by a second tour with Demolition Hammer and Obituary. Grewe stopped playing bass and Sebastian Swart joined as the bass player. In February 1991, the first actual full-length album was recorded in the Woodhouse studios, titled Cursed. Xeroxed Covers. Studio tapes with a Morgoth sticker on the front. The tape case had the band info. No lyrics. Bootlegs have a different layout of the tracklisting. Pro printed covers. This was later released as a EP. Lyrics on back. Black Tapes.